A few years back, I went to see my doctor. I’d been experiencing a number of apparently unrelated minor ‘symptoms’. I wanted to make sure the symptoms really were minor and unrelated, and not due to some more serious, underlying, undiagnosed condition. One of my symptoms was a recurring, dull pain in my left shoulder. I could never work out precisely where the pain was coming from, but it was, I explained, “definitely somewhere in the shoulder region”. My doctor smiled and said she knew exactly what my problem was, as she experienced it too! Like me, she suffered occasional bouts of acid reflux in her stomach. When acid reflux kicks in, excess gases expand the stomach wall, putting pressure on your diaphragm. One of the nerves associated with the diaphragm runs a convoluted route via the left shoulder blade and hooks up with the rest of the nervous system in the neck. So, when my acid reflux kicked in, I experienced pain signals that seemed to be coming from my shoulder, but which were actually coming from my diaphragm. Thanks to Alice Roberts’s excellent book The Incredible Unlikeliness of Being, I now know the culprit to be one of my two phrenic nerves. It turns out the phrenic nerves’ convoluted paths through my body are a consequence of both our species’ evolutionary history, and the complex way in which the unfolding blob that was to become me developed in the womb. Alice Roberts is my favourite TV science presenter. She has a rare talent for simplifying scientific ideas without dumbing them down. I don’t know whether she ever has to stand her ground against producers exhibiting the modern preference for simplistic explanations, but I like to think she occasionally has to insist on being allowed to use (and explain) the correct scientific terminology. In other words, to treat her audience like grown-ups. I’m glad to report Roberts writes in very much the same style as she presents. There is plenty of scientific terminology in this book, and some of the concepts explained are complex, but the writing simplifies without surrendering to the simplistic. It’s the sort of writing that makes you feel cleverer simply for having read it. Being treated like a grown-up can have that effect on people. The Incredible Unlikeliness of Being takes us on a head-to-toe (then back up to the arms) tour of the human body. It shows how the vestiges of our evolutionary history are written into our bones and organs. Our bodies are compromises, constrained by physics, and by our heritage: Inelegant Design, as I like to think of it, in stark contrast to the Intelligent Design our bodies would presumably exhibit, had they really been put together from scratch by an omnipotent, omniscient, benevolent creator. 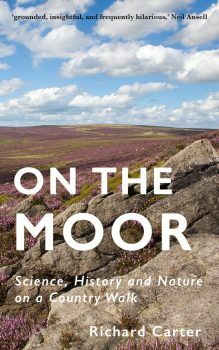 It’s a subject that interests me very much, sneaking its way several times into my own book, On the Moor: science, history and nature on a country walk. But The Incredible Unlikeliness of Being is not just about pointing out our design flaws. It celebrates the marvellous, frankly bonkers way in which our bodies are constructed in the womb. It explains what we can tell about our evolutionary predecessors by looking both at their remains, and at our own bodies. It discusses conflicting hypotheses about various bodily structures, and how we now know some of these to be wrong. And it does all this with charm, intelligence, appropriate humour, and excellent line-illustrations courtesy of the author.